Fielders KingFlor® KF57® offers builders a steel formwork for composite concrete slabs that is light weight and easy to use, making this the perfect solution for concrete and steel framed construction. This excellent ‘steel decking’ product was designed to combine effectively and harmoniously with a concrete slab and once laid becomes a permanent part of the slab, therefore eliminating formwork stripping. The major benefits of the KF57® product are its unique profile with wide pans that allow clear access for in-floor services, minimal propping and easy access to the underside of the slab. 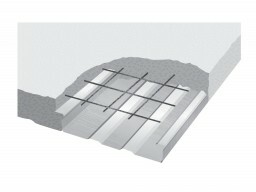 Designed to be able to achieve high fire ratings it is ideal for many applications, retail projects in particular, as the closed rib profile is completely imbedded in the slab offering a major reduction in fire reinforcement.